Photograph by Alain Jocard for Getty Images. After Clare Waight Keller’s spectacular off-the-shoulder dress for this year’s Royal Wedding, Givenchy now has the full force of Meghan Markle’s fairytale behind it. The question at Sunday’s couture show was: where does Waight Keller take her mantle now? With her royal wedding credentials, she is perhaps the woman best positioned to show us what modern femininity means. Photograph by Bettmann via Getty Images. While these sorts of pieces seem destined for the House’s most treasured clients, Waight Keller also carried this energy into red carpet gowns. Sometimes haute couture feels like the end of Marie Antoinette’s reign, when they’re plunking candies in their mouth and ordering more shoes because there’s nothing to do except demand more beauty. But the best pieces in Waight Keller’s second couture collection for Givenchy felt restrained and bizarre, showing us there’s always more to mine in our past. At the show’s finale, “Moon River” played, which made me want to roll my eyes a little, if only because of the anodyne free spiritedness that Breakfast at Tiffany’s has come to represent in popular culture. But in retrospect, the film was as unusual as Givenchy’s designs were (though, of course, Givenchy’s legacy is more refined than Tiffany’s, which was perhaps the only Southern Gothic masterpiece, with all the requisite emotional gore and sideshow characters given leading roles, to be set in New York). 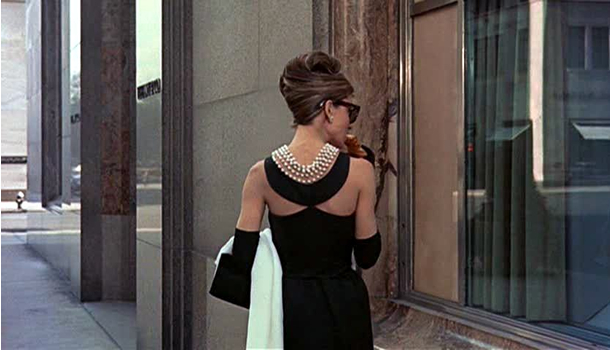 The film’s most iconic image is one of the first shots, when we see Hepburn from the back, gazing into the jewelry store’s front window; what looks like a simple black dress from the front is, in the back, a strange form of two crescents barely meeting. The final dress of the show was a velvet, hooded gown, simple from the front, but in the back, there were those two crescents. Fairytales are always so much better when we take pleasure in how strange they are.